Monday February 5th 1894 I boiled ham and done some other work this morning. After dinner baked a cake, cleaned the silver, and went up town. I dressed a chicken in the evening and prepared nuts for a cake. Tuesday February 6th 1894 I made pressed chicken, baked a cake, swept the rooms down stairs and cleaned lamps before a late dinner. Will went to the country and was late getting back. He helped me to out the leaves in the table and Fanny came in time to help me set it. It was a delightful day and evening my company came and every thing passed of pleasantly. It was late before we went to bed. Wednesday February 7th 1894 I went up town twice in the forenoon in regard to renting the house. I ate a lunch and went over the river after writing to Mother. The Spencers were at Fannys. I came home to get early supper. Will had been gone to a sale all day. 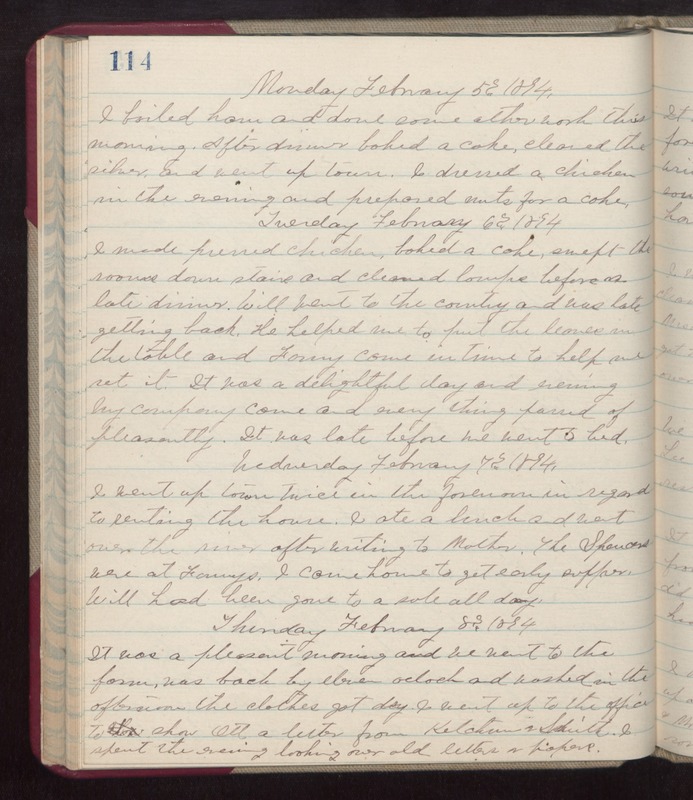 Thursday February 8th 1894 It was a pleasant morning and we went to the farm. was back by eleven oclock and washed in the afternoon the clothes got dry. I went up to the office to show Ott a letter from Ketchums & Smith. I spent the evening looking over old letters & papers.